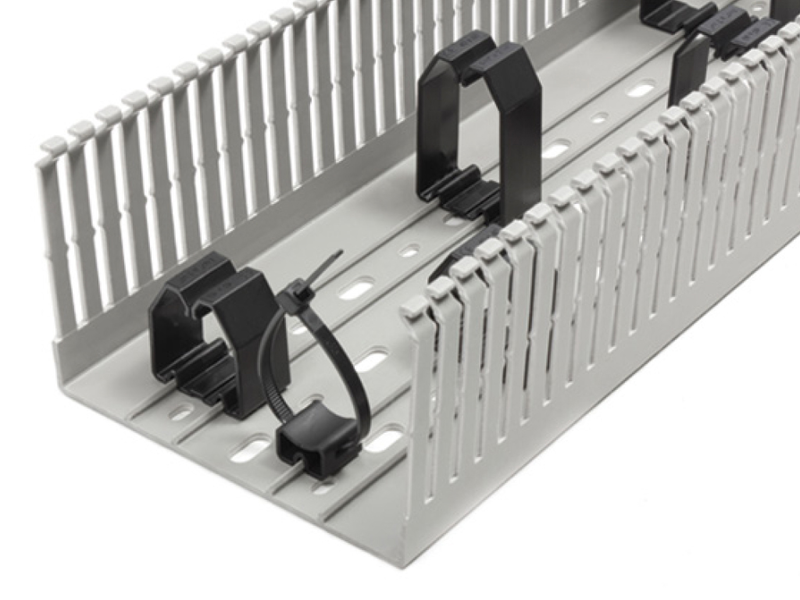 Conta-clip has expanded its range of usability aids for VK cabling ducts, adding fast-mount wire holders. The wire holders can be clipped into the ducts without tools. They are designed to make it easier to neatly arrange conductors and keep signal and power lines clearly apart. They simplify adding new wiring, since existing cables stay put and do not come lose and become entangled when the cover is removed. Also cleaning is made easier. The wire holders are available in two versions. The DHG-type holder has closed spring brackets – cables can be pushed in from above. It comes in three sizes: 34 x 35 mm, 34 x 53 mm and 53 x 75 mm. The DHGB holder is a small clip that securely holds cable ties of any size. The wire holders are made of RoHS-compliant PC and PA. They are suitable for ambient temperatures from -20 °C to +60 °C.